Working from home often sounds better than it is. Just when you’ve brewed a cup of coffee in the Keurig and you’re ready to sit down and work in your pajamas, you’re suddenly reminded of all the cleaning you need to do, plants you need to water and dogs you have to walk. So, you travel to your office-away-from-the-office: your favorite coffee shop. Cafes have a lot of competition in Buffalo. 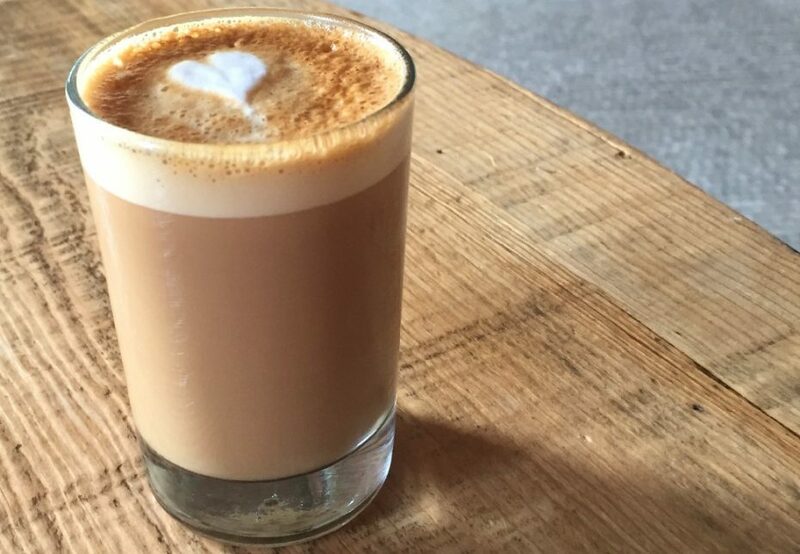 There are cafes that cater to vegans, coffee bean nerds, or flavored latte fans. Some coffee shops boast better Wi-fi or more outlets than others. 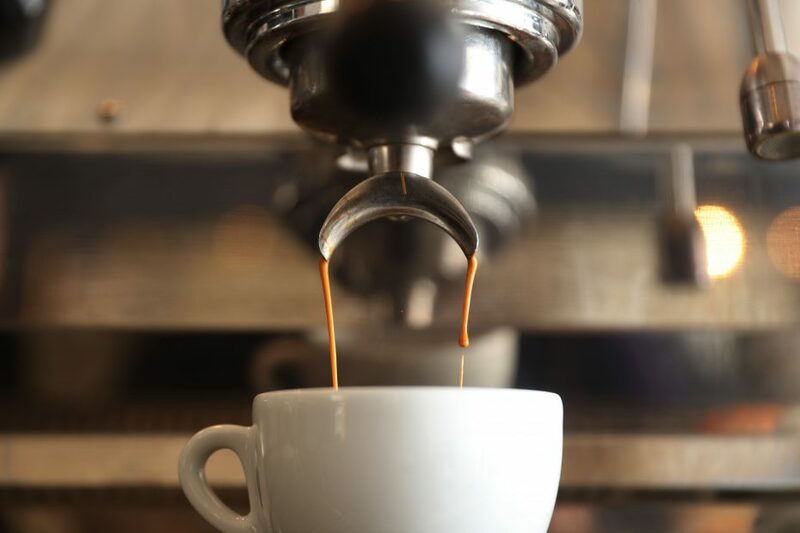 Some have full-service menus and other focus exclusively on coffee. A favorite coffee shop is a personalized choice, based on what’s most important to you, like food, and what you can sacrifice, like a normal amount of outlets. As a part of our “According to Bloggers” series, we’ve asked local bloggers and Instagrammers about their favorites. Where can you find Buffalo’s best brunch? An activity that doesn’t include food and cocktails? Best photo spots? Here are the cafes all over the city the bloggers swear by, and why. Recommended by: Tom Przybylak, blogger at local food and dining site Buffalo Eats. “Kornerstone Coffee has been our favorite local roaster ever since we got back from a trip to Costa Rica and learned to appreciate better coffee. They opened a spot in East Aurora which is pretty cool – but did you know they do home delivery for no extra charge? We get fresh roasted beans delivered to our house every Wednesday for less than what we would pay for a bag of Starbucks – and it’s way better,” Przybylak said. Kornerstone coffee, micro-roasted in Kenmore, used to be found only in kitchen cabinets or at restaurants. But now, the roastery has cafes in East Aurora and Larkinville. Of course, they serve their own coffee and espresso drinks, but there’s also a sharp focus on health food. At both locations, the kitchen utilizes tofu, fruits, vegetables and grains in most of the menu items, as well as operating a full juice and smoothie bar. For those who choose cafes based on how long they can hole up on a laptop at them, Kornerstone is a contender. Start your day with the coffee, then power through a midday slump with vitamin and protein-packed smoothies. It’s nothing short of productive — eating kale, in any form, is fruitful. Recommended by: Caralyn Mirand Koch, plus model and content creator. “I recently stumbled upon this little gem while shooting some blog content. Not only was the coffee exceptional, but the service was also superior and he let us take lots of pictures!” Koch said. The intimate coffee roastery and cafe sits in an eye-catching part of downtown. Inside, peer out the large display windows at the Gold Dome building, while waiting for your coffee or vegan oat milk latte, or while biting into a strawberry “plop tart” baked by Fairy Cakes Cupcakery. Overwinter doesn’t try to be a jack-of-all-trades. The menu is small and simple, as is the coffee selection. The owners focus on quality coffee, pour-overs and lattes instead of wild flavors or fancy syrups. Recommended by: Both Lindsay Robson, blogger at Nickel City Pretty and founder of the Buffalo Blogging Network and Caitie Newman, photographer and Instagrammer. “Whenever I’m working from home, I choose Public to be my home away from home. Their food, pastries, coffee and teas are to die for. I’ve spent hours inside there at a time, have eaten both breakfast and lunch and guarantee I will never become sick of it,” Robson said. “Delicious coffee + desserts in a gorgeous space,” Newman said. 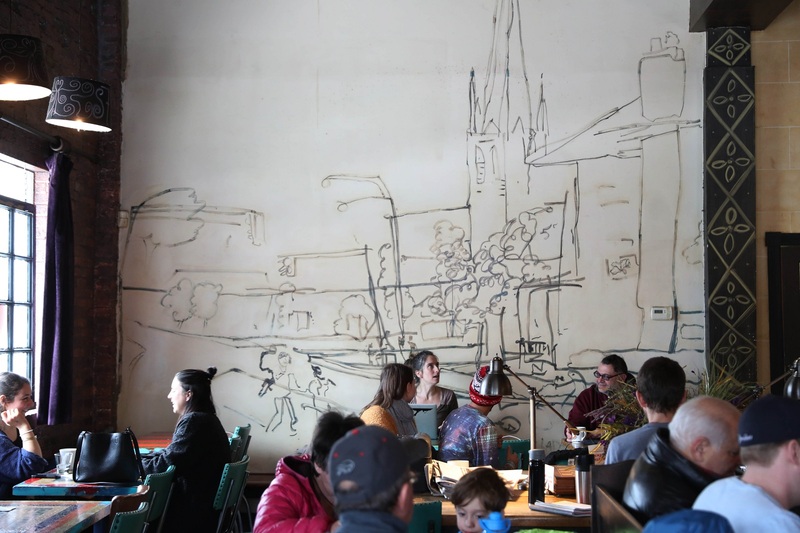 In Buffalo’s kingdom of niche coffee houses, Public Espresso reigns king. Vogueish minimalist decor, stark white walls, and furniture colored in bright hues lend to its creative coffee-consuming ambiance. On the menu — detailed in typical black letter board fashion — expect a few special lattes featuring pleasantly weird flavors and the classic espresso drinks. The hot chocolate is an especially indulgent treat, blended with a made-from-scratch chocolate ganache typically used in pastries. Recommended by: Billy and Pat Sandora-Nastyn, YouTube content creators at Billy & Pat and Donnie Burtless, blogger at local food and dining site Buffalo Eats. “A literal wedge of gorgeousness, this Five Points cafe serves up drinks with a view. Make sure you check out the bathroom wallpaper!” Billy and Pat said. “I’m just starting to drink coffee and quite frankly, I only drink cold brew year round. That said, I absolutely love everything about Remedy House on the West Side. It feels like something you’d stumble across in Europe and their cold brew is very good. I’m a 34-year-old dude in Cheektowaga, but it makes me wish that I was a college student spending a weekday working on my laptop,” Burtless said. Remedy House does have a distinctive European feel, from its Mediterranean menu to its French rattan bistro chairs and summer sidewalk cafe. Like Burtless said, college students with laptops flock to the cafe, as do young friends and couples. There is a lot to appeal to them: hip, indie music playing, coffee with dollar refills and a beer and wine menu. Plus, if you’re looking for something to Instagram, the shop is prime photo fodder, in the best way. No filter needed. And just wait until you see the jungle-wallpapered bathroom. Recommended by: Naa Quaye “Nkay,” fashion designer at NKM Styling and blogger at The Boss Diary. “I mean, can this place get any cuter? The owner Maggie is so friendly, and she makes a GREAT oat milk latté,” Nkay said. Reasons to visit North Buffalo’s Hertel Avenue have increased over the past couple of years. Hop from a restored historic movie theater to a new wine bar, from modern restaurants to clothing boutiques to coffee shops. During warmer months, you even have your choice of three ice cream shops. Over the summer, Roots joined Hertel’s growing list of places to consume drinks, offering a locally sourced menu of coffee drinks using Buffalo’s Overwinter Coffee beans, teas and local Snowy Owl kombucha. The quaint cafe has a sunny feel, boasting views of an increasingly bustling Hertel Avenue from large windows. “Aside from its beautiful aesthetics, you can grab the best cappuccino and croissant in town here,” Ismail said. Rowhouse opened on Delaware Avenue, among the rowhouses, in 2017. At the time, The News’ Food Critic Andrew Z. Galarneau called it “Buffalo’s most ambitious restaurant.” Rowhouse isn’t trying to look like anything else, except possibly, the outdoors. The three-story cafe/bakery/restaurant offers a full coffee bar, a farm-to-table dinner menu, smoothies and cocktails. But the real treat is in its dazzling interior. While dining, you’ll feel like you’re inside an aristocrat’s lavish living room. 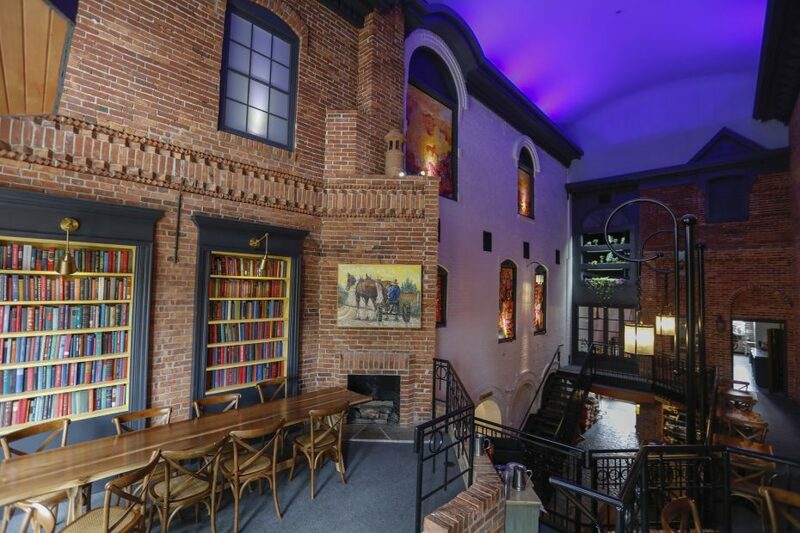 While sipping a coffee in its second-floor library, you’ll feel like a character in a Disney movie. Look up, and you’ll be transported to a starry alley bistro, one that’s temperate with clear skies, even if the real sky outside is dropping another foot of snow. Recommended by: Beau and Lindsay Riggs, bloggers who write about things to do for couples and families at Buffalovebirds and Scott Robinson and Alix Gilman, bloggers at In a DC Minute and owners of The Shirt Factory in Medina. “They roast their beans in small artisan batches to ensure the best flavor. Their Lavender Smog on ice is to die for!” Beau and Lindsay said. “We’re smiling as we try to answer this in a way that doesn’t involve the Shirt Factory. We actually get our coffee from Lockport’s Steamworks Coffee and love the bar seating, pour-overs and ownership. If we’re not seated at our own, we’re visiting Jon in Lockport,” Scott and Alix said. All of their beans are either fair-trade or direct-trade, straight from the farmers. They make many of their own flavor syrups, which they utilize to make creative lattes and cappuccinos that you possibly would not think to order. If you have some time to kill, choose from an overflowing bookshelf of board games to sprawl out on a table overlooking the Erie Canal. “I’m somewhat of a homebody and even work from home, but whenever I’m at Sweet_ness 7 Cafe, I feel like I’m enjoying the comfort of working in someone else’s home. Warm, cozy and eclectic- plus they make a pretty stellar almond milk chai latte,” Phillips said. Tall ceilings, exposed brick and mismatched decor contribute to Sweet_ness 7’s homey atmosphere. A communal table with outlets, reading materials and a big lamp can fool you into thinking you’re working in a trendy office space and not just a neighborhood cafe. The menu makes room for vegans, with tofu, house-made vegan sausage and vegetables. Glimpse circulating espresso specials on the board behind the barista’s counter, as well as a full menu of hot and cold espresso and tea drinks.